So, here we are, ready to go and win tons of money. It seems that all the roulette boot camp is done and we are about to start winning but there are some roulette tips that can help you. The matter is that in order to play any casino game it is important to know not only its rules but also general principles of behaviour at gambling house. First of all, you should dress up nicely. Nobody wants to sit next to the smelly, shaved a decade ago man or a woman with "exploded" hairdo and they look like a miner after three shifts but who never took shower after. That is #1 roulette tip. Besides, there can be a dress code at the casino. 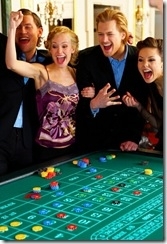 The American casinos are not very demanding in the clothing aspect, but still people that like us more, if we look nice. But you need the tips in order to apply them to the real game of roulette. Moreover, you need to know the rules. Be nice and people will treat you better. Smile. Do not touch the dealer's hands. Nothing will happen to him, but it is bad form. Before are going to gamble in a specific casino, check out if the entrance is free for everybody, because there are the casino-clubs, where only members can play. There can also be some requirements for entering. If you win, you should tip the dealer. In many casinos in Europe it is forbidden, but the US casinos welcome it. If you are playing for quite a long time, you can tip the dealer every ten spins. That how you show your attitude and it turns the dealer on your side. If you see that something is happening at the table and you cannot understand what and why, you can ask the dealer and he will explain it to you. If you notice some moves or mistakes that can affect your play and winnings, you should speak out. But again, be polite and kind. These roulette tips are not necessary but if you follow them, you will realize that the game can bring more joy and pleasure. You will be able to meet new people, strike up an acquaintance with somebody, with whom you have a common hobby.